The way an art gallery and museum spaces are designed not only affects how visitors and customers perceive it visually and navigate it spatially, it may even affect its very success. With the pressure for continued revenue, there is real need for flexibility and maximizing existing space adaptable spaces to allow greater revenue. Imagine if you suddenly had extra space to hang art, or a way to flexibly contain a particular installation or piece. Cavernous and unwelcoming spaces can also be transformed into more inviting and useful smaller spaces to give a greater intimacy to the art presented. With our partitions and flexible hanging systems, this is now possible for much less than you think. In addition to Art Gallery events, there are many other activities that happen in or around the Art Gallery and Museums such as private exhibitions, public auctions and guided tours inside museums. This can often cause strain and stress on already stretched facilities and without effective ways to guide people around your space, you might find crowds causing chaos if an exhibition is very popular. Maximum space versatility and adaptability is therefore critical to accommodate multiple requirements – often at short notice. 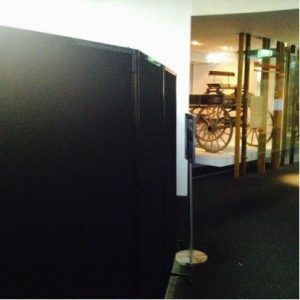 We offer a range room dividers that are purpose built for Art Galleries and Museum environments. They are designed to provide a temporary or semi-permanent solution and offer maximum flexibility in terms of room configuration and gives you lots of extra hanging space. A private space, meeting room, change room, or office space can created in a matter of seconds – for however long it’s required – and can be packed away just as easily. You can also quickly block off areas from prying eyes during setup. Easy to move, fold and store – when not in use simply roll them away. A specialist range of engineered acoustic polycarbonate partitions are also available. They are highly durable and are 100% waterproof and easy to clean (practical).